I'm a sucker for good dystopian fiction. And I mean a good dystopian fiction. I don't want to read about zombies or nuclear warfare. I want to read about circumstances that have led countries astray and have gotten aforementioned countries into places where they're now using bizarre caste systems. I don't seek out the dystopian genre these days like I used to, having been burned too many times before, but when one of these novels strikes my fancy, I give it a shot. 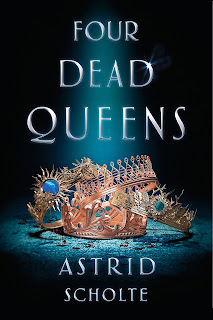 Four Dead Queens by Astrid Scholte didn't even need a shot. The cover did all of the work and got me hook, line and sinker. 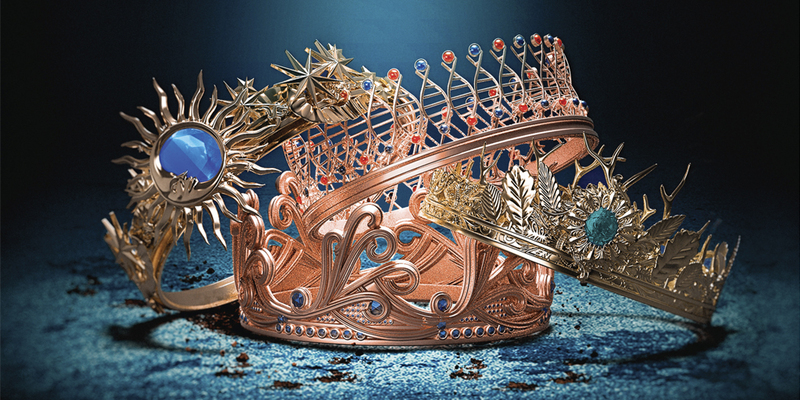 The toppling collection of glittering crowns and the bold title let you know that this was going to be one heck of a ride. And let me be the very first to tell you that this was a ride you won't want to get off. Four Dead Queens follows thief Keralie as one of her routine jobs sends her spiraling into a life-changing situation. She listens to her boss, Mackiel, when he says to steal a case of comm chips from an Eonian messenger. Kralie thinks that the high-priced item would sell at auction, catch a pretty penny, and be another notch in her belt. But when the messenger shows up at the auction house and the chips are never put on the block, she knows that something is wrong. It's only when Keralie figures out that she's been played and she swallows the comm chips does that she understands the reigning monarchs — the four queens of Quadara — have been murdered. What follows is a twisting, turning, looping rollercoaster of mystery and intrigue. There's nothing to prepare you for the lightning speed in which you'll flip through the pages. You want to find out how each queen meets her demise, who the killer is, and why the murders have taken place. No clues can quite prepare you for the insanity that is Astrid Scholte's debut novel. Thankfully, I was able to talk to Asrid and pick her brain about Four Dead Queens (in the least spoilery way possible for you all) and who she dreams would be cast in the perfect film adaptation. Keep reading to see what she has to say! What was the catalyst for the story of Keralie, Varin, and the four dead queens of Quadra? Astrid: I had previously written two YA fantasies that I had failed to get an agent with and I was brainstorming what my next manuscript would be. 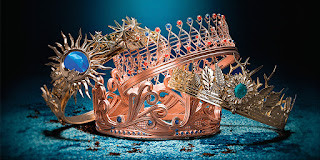 I wrote a list of all the things I loved, not only in YA but in TV and movies, including forbidden romance, royal intrigue, deception, hidden secrets, shifting agendas, and unexpected twists and turns. I’ve also loved murder mysteries since I was a kid and thought it would be unique to set a murder mystery in a fantasy world. The main catalyst was when I had a dream about sitting in a horse-drawn carriage wearing an elaborate Victorian-style dress and a futuristic silver car flew past, I wondered what kind of world would exist with such contrasting technologies. That was how Quadara was born! I have to admit, it seems like half of the fun of writing a dystopian novel is coming up with names for characters, locations, and government. Would you say that’s true? Absolutely! I love playing around with new words and worlds. Writing fantasy gives you absolute freedom, but at the same time, you need to establish rules so that the world, and the people inside it, feels believable. The fun part is working out the boundaries for the world to exist in, and then see how far you can bend it, without breaking. Okay, let’s jump right on in. The book starts with a bang: a robbery and a murder. It’s what sets the whole story in motion. What made you decide to do that? I knew from the beginning I wanted to have a thief as the main character — someone who isn’t necessarily “good” from the outset — and have them entangled within this deadly plot to kill all the queens. I wanted the main character to have to decide to “do the right thing,” which wasn’t what they were used to doing. As for the murders, I wanted to jump straight into the action and have the murders play out on the page, from the queens’ point-of-view, as I thought that would generate the most drama. 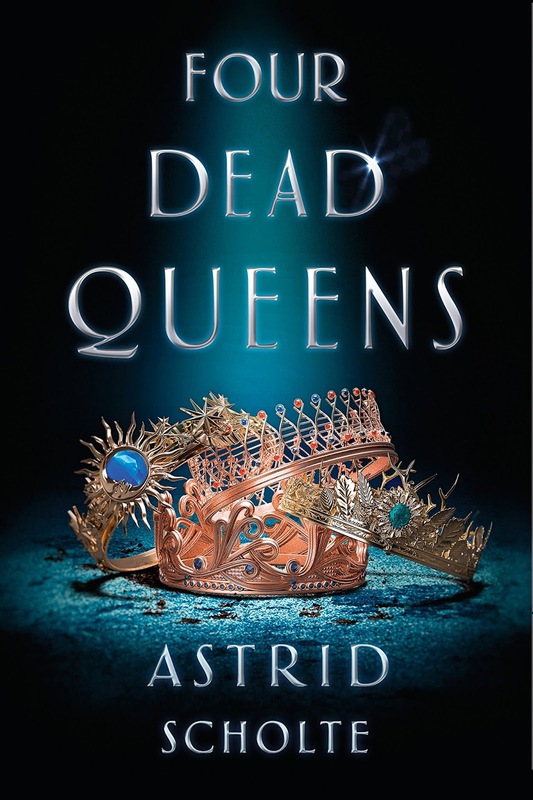 Because Four Dead Queens is mainly a murder mystery/thriller that just happens to be set in a fantasy world, I knew the pacing would have to be breakneck and have the rules of this complex nation unravel as the mystery does. I want to talk about how you have a society entirely ruled by not just one, but four women, for hundreds of years. Talk about girl power! What do you hope female readers take from that choice? In this current climate, I think it’s really important to see female characters not only working together but supportive of each other. Each queen has a very distinct personality and different background and culture, but they come together to ensure the peace of the nation. I wanted to show that we should support each other, regardless of where we come from and how we may differ from each other. Ultimately, it’s about tolerance and finding and creating your own family. Keralie and Varin may come from different quadrants, but you discover over time that they feel trapped by the hand they were dealt and wish to be free of the constraints placed on them. Was that mirroring intentional? To a certain extent, yes. I love the opposites attract and hate-to-love tropes, but at the same time, I wanted the love interests to bond over a shared goal. They both want to change their situation, break through restrictions, and be who they’re meant to be. In finding themselves, they also found each other. Of all the crazy twists, the comm chips and the assassin’s identity reveal were the most insane. How did that come to be? I actually didn’t know who the killer was for a third of the first draft! I was brainstorming who could be the culprit and when I hit on a specific idea, I knew it was the winner! I love hearing readers’ responses to the ending! If Four Dead Queens were to get turned into a movie (which I very seriously see happening), who would be your dream cast? I would absolutely love if Four Dead Queens became a movie or TV series! As a visual writer, I clearly see the characters and scenes in my head before writing. Queen Marguerite: People have remarked that my painting of Queen Marguerite looks like Jessica Chastain, and there’s a reason for that! I would love if she played the auburn-haired Queen of Toria. Queen Stessa: Banita Sandhu looks exactly how I would imagine the youngest queen on screen. Queen Iris: Isabel Lucas has the right regal look for the stern but compassionate queen. Queen Corra: Letitia Wright would be wonderful as cautious and controlled Queen Corra. Keralie: Dove Cameron would be perfect for the charming and brash young thief. Mackiel: Darren Criss, I was so impressed with his performance in The Assassination of Gianni Versace: American Crime Story. He can play both charming and dangerous, key for Mackiel. Varin: While he’s a little old, Jeremy Irvine would make a great Varin! What books would you recommend our readers pick up? I adore the Lady Helen and the Dark Days trilogy by fellow Aussie, Alison Goodman. I love the blend of the supernatural and historical. It’s clear how much passion Goodman has for the Regency era and it’s like being transported back in time with such exquisite detail. Four Dead Queens is currently available for pre-order and will hit shelves February 26th. Make sure you order your copy today, and find Astrid on Twitter and Instagram!